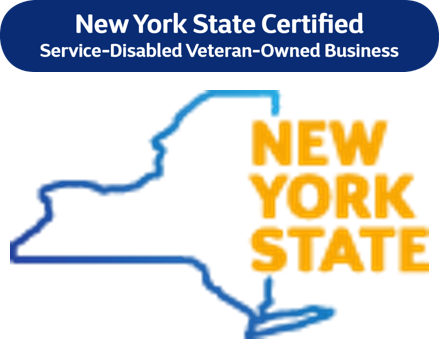 The TruView Team is proud to have recently received its certification from the New York State Division of Service-Disabled Veterans Business Development (DSDVBD) as a Service-Disabled Veteran-Owned Business (SDVOB), and especially proud of the military veterans in its employee ranks. When it comes to hiring veterans, TruView President Nick Auletta—himself a former U.S. Army Captain with over 44 months of active duty service in Iraq—is quick to point out, “Hiring veterans is not a charitable thing to do; it is a smart thing to do. Their leadership and service experience in challenging environments adds to their professional qualifications and helps make us a great company in a dynamic industry.” Director of Investigations Robert Krolikiewicz (U.S. Marine Corps), Operations Director Tim Hendrickson (U.S. Army), and Operations Supervisor Robert Tolley (U.S. Army) are among the veterans employed by TruView. To receive its SDVOB certification, TruView had to meet requirements as an independently owned small business with a significant presence in New York state, with more than 51% of its ownership being a service-disabled veteran with an eligible service-connected disability from the U.S. Department of Veterans Affairs, as well as other requirements. In 2014, Governor Andrew Cuomo signed into law the New York Service-Disabled Veteran-Owned Business Act, which encourages and supports State-certified SDVOBs to play a greater role in the economy by increasing their participation in New York State contracting opportunities. The law set a statewide participation goal of 6% for SDVOBs in State contracts. New York’s is the fastest-growing program of its kind in the nation, with certification of 225 SDVOBs from a multitude of industries in the first two years of enactment.